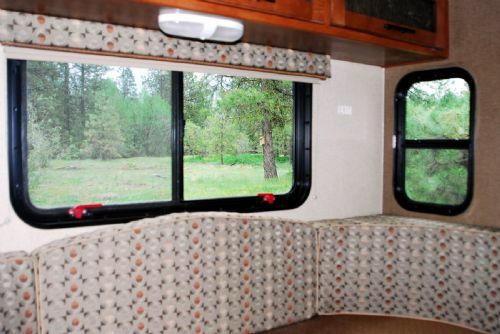 The first item I noticed with our R-Pod 179 was lack of peripheral window view in the dinette slide out. I measured the side wall and found a 21" x 14" window that would match and be suitable. 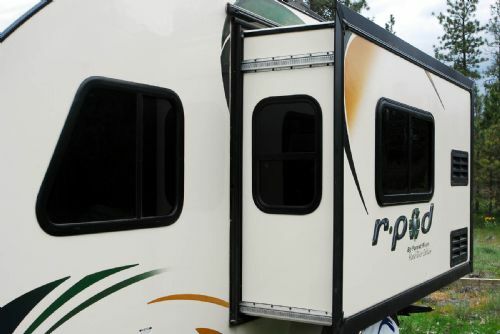 It is from www.Teardroptrailerparts.com - window WD06. It arrived quickly and came with an internal finish frame and mounting screws. My installation took longer than I thought. Hopefully after sharing my issues, it will only take about an hour or so. Make a template from cardboard and trace it where you want it on the inside wall. It is a 14 1/4" x 21 3/4" cutout with 4" corner radii. Drill an 3/8" jigsaw start hole just on the inside of your template mark. Then center and place the template on the outside wall and use a Sharpy marker, trace the cutout. The wall is 1-11/16" thick. I put masking tape on the jigsaw bottom plate as to not scratch the finish. Use the jigsaw with a medium fine blade to cut out the opening. Putting in the window should add some strength to the wall, so I'm not that worried. The screws that came with the window are not long enough. You need 15 8x3/4" black capped window screws. Pre-drill the finish frame screw holes on the window frame using a 5/32" drill. It's hard, but try to center all holes the best you can. 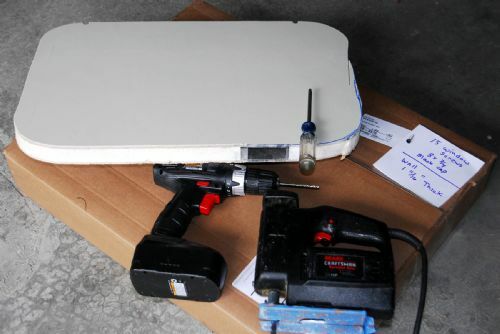 Clean the outside portion of the opening with acetone before fitting the window. Put a seam of good silicone sealant on the rubber window seal and place the window into its opening - best to have an extra person to hold it from the outside. 15 screws later one is finished. After the silicone set, I cleaned up any extra on the outside with a razor blade and acetone. I assumed the screws that came with the window worked - no. Only after I put silicone on the seal I found this out. And I tried doing it by myself. Best to have someone on the outside to hold the window in place while you are securing it. Cut the window opening from the outside. I tried from the inside and it was hard to see and cut a perfectly straight cut out line. Once I hit the aluminum channel bar, it was too late to back out of this project!! You have to drill pilot holes into the window frame for the correct screws and make sure they are centered as well as you can make them. Hope your window addition goes faster and smoother with what I've learned. From the photos, you can see the view is now fabulous! I wouldn't like the idea of cutting out a large chunk of the framing, but time will tell if it's an issue. It certainly looks good, and I am sure it makes it feel more open.. It might simply be a corridor for wiring with the wall used in other model applications. But, as you say, time will tell! It isn't. Only one pod uses this size slide. There are no appliances in the slide. I'm hoping to add windows to my 179 slide out as well. Was the aluminum channel near the bottom of the cut, or the top? I'm thing I want to put a smaller window in just above the aluminum channel if possible. How thick were the walls? Good job on you Pod-Mod! 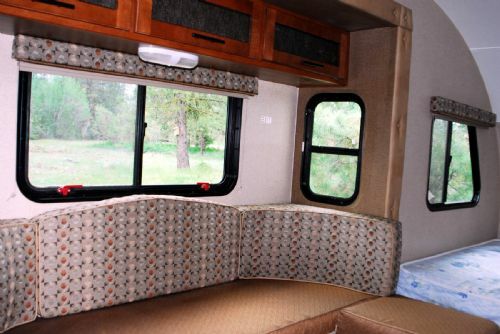 R-Pods definitely need a window in the dinette area. Cutout: 14 1/4" wide x 21 1/4" high x 1 1/4" thick. The aluminum rectangular channel is towards the top of the cutout. It is 2 1/2" x 1". I think its only purpose is to add a little structural strength but the ratcheted bars that pull in and out the slide-out supply that. There was no wiring going through which was my main concern. We've had ours since 2015 and have had no issues with this modification. The window came with inside window frame self tapping screws which I assumed were long enough. They weren't. I had already siliconed the outside window portion then was going to screw in the inner frame and found the small screw thing out!. Had to stop, buy the correct length screws and drill a pilot hole to make sure it all fit together. That was the only issue with my installation. So best dry fit everything, then silicone a seal and install. Attached is a photo of the cutout if that helps. 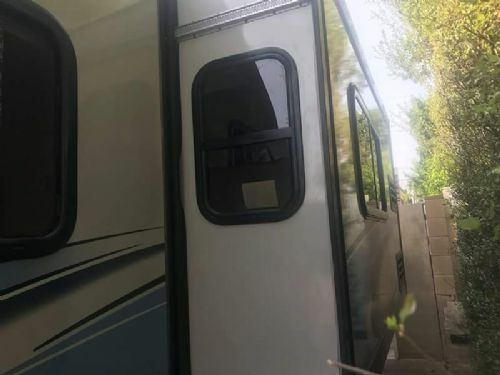 John, finally put a window on my 179 slider! Thank you for the accurate info and motivation. Looks like you did a really good job. So far my installation has caused no structural issues. I'm amazed on how much extra view it adds plus the benefit of the closet window. Personally I think it will add to the resale value of our R-Pods. Off for another R-Pod adventure. Hired to record and do sound for the montana Baroque Festival at Quinn's Hot Springs. R-Pod really packed with gear. It's only going to be 97F there today! !